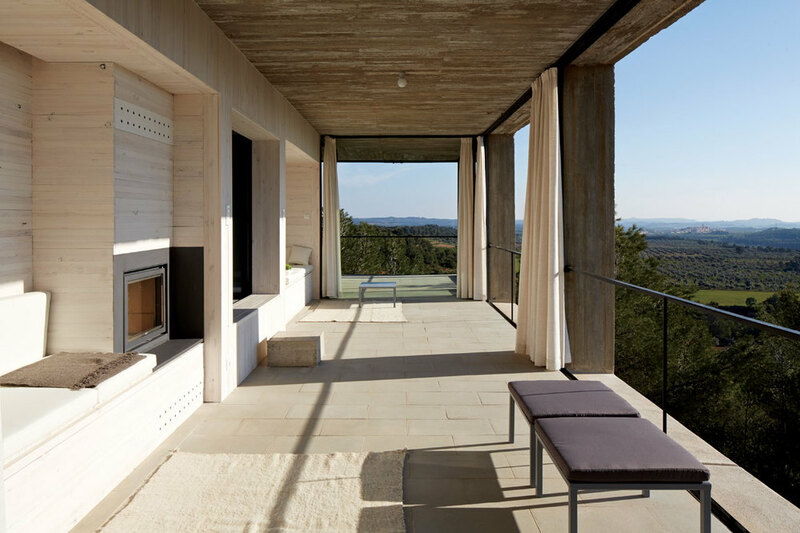 Chilean Architectural firm, Pezo Von Ellrichshausen, have completed the beautiful Solo House in the middle of a native forest outside of Barcelona. The massive monolithic and sculptural piece of standing architecture acts as a private home which is supported by a blind podium, hidden below in the trees. The team experimented with different types of rooms throughout the unique home, explaining that "transparent and symmetrical rooms are articulated by open corners. A portico too narrow as to hold a static room and too deep as to hold a vigilance balcony. On the platform’s aerial world there is a single interior room. This room has no roof." Mauricio Pezo and Sofia Von Ellrichshausen, the duo that spearheaded the project lifted the house parallel to the trees, up towards the skies, to give it's owners optimal vistas and views, providing a magical feeling of being up in an open tree house. The Solo House is finished in warm tones of concrete which complement the natural surroundings. Glass windows and doors are used to take advantage of all views, the idea of this gives priority to the surroundings over personal privacy; and makes nearly every outside room double as a porch or patio. Throughout the home, unique pieces of contemporary furniture are scattered, adding small pops of color to the monochromatic architecture. A great feature to the Solo House is it's modern square pool where the water reaches all the way to the top, and the views extend for miles!